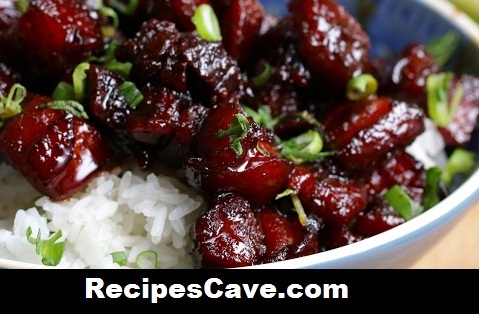 Glazed Pork Belly Recipe - Hi guys today we are going to share Glazed Pork Belly Recipe in Chinese Style. Follow these simple steps how to cook that. Here is what you'll need to cook Chinese-Style Glazed Pork Belly for Servings: 2-3 peoples. Cut the pork belly into roughly 1-inch chunks. Bring the water to a boil in a pot, then add the pork, ginger, onion, and garlic, cooking for about 3-4 minutes. Remove the pork from the water and drain it on a plate lined with a paper towel. Discard the remaining water and vegetables. After cleaning and drying the pot, heat it with the oil over high heat. Place the pork back in, cooking until browned. The oil may pop and splash so be careful. Add the brown sugar, turning the heat to low. Stir continuously until the sugar has melted, caramelized, and coated the pork evenly. Immediately add the soy sauces and rice wine, stirring and cooking for about 5-6 minutes or until the liquid has reduced into a thick glaze. Add the water, stir, and cover the pot for about 45 minutes. Make sure the mixture is at a low simmer, not boiling. Check and stir every 10 minutes or so and add water if the pot is getting dry. When the 45 minutes are up, remove the lid, checking to see if the sauce coats the pork in a very thick glaze. If it is too runny, continue to stir, uncovered, until the liquid has reduced. your Glazed Pork Belly Recipe is ready to taste.